The Chandler Engineering Automated Shear History Simulator (ASHS) is a system designed to prepare and load fracturing fluids dynamically into the Model 5550 Rotational Viscometer. The fluid is pumped through a combination of tubes at various rates and durations in order to simulate pumping conditions experienced during fracture stimulation treatments. 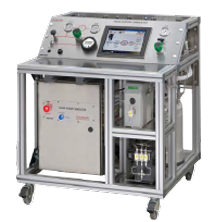 The ASHS consists of a pressurized fluid reservoir, two injection pumps and four tube assemblies. An integrated touch screen computer with a graphical representation of flow paths allows the user to configure the instrument to simulate actual flow conditions. A base gel fluid is placed into the pressurized supply reservoir for delivery to the suction side of the flow pump. Pressure is applied to the reservoir via an air regulator mounted on the face panel. The gel pump is constructed of high pressure stainless steel for corrosion resistance. The pump is driven by a frequency driven servo motor that can deliver 0-140 ml/min. The crosslinker additive pump is a stainless steel HPLC pump capable of delivering 20 ml/minute. The two fluids are combined into a micro-volume mixing tee for complete homogenization. The combined fluids then travel through a series of tubes that use selector valves and may be programmed in various tubing configurations. Pressure transducers are located at the entrance and exit of the tubing assemblies to accurately monitor fluid behavior. Fluid pressures are indicated using the graphical user interface. The software monitors all measured parameters such as pump rate, system pressure and capillary pressures. To ensure the proper volume is transferred once the shear simulation is complete, dynamic loading of the Chandler 5550 rotational viscometer is achieved with precise control from the ASHS software.